Westmead Hospital Aboriginal Liaison Officer Narelle Holden, Westmead and Auburn hospitals general manager Brett Thompson, WSLHD Aboriginal Health Service manager Belinda Cashman and WSLHD Aboriginal Immunisation Liaison Officer Joanne Cheatham. 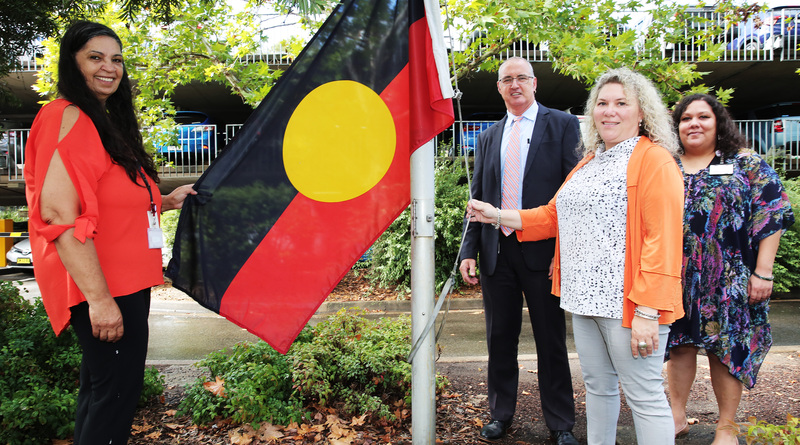 The skies remained clear momentarily for the raising of the Aboriginal flag at Westmead Hospital to celebrate National Close The Gap Day. Aboriginal Health Services manager Belinda Cashman said Western Sydney Local Health District works hard to improve the lives of Aboriginal people in Western Sydney. The flag raising was part of an event held at the hospital today which included a speech by the hospital’s general manager Brett Thompson and a dance performance by Mount Druitt dance group Gadibirrong. WSLHD Aboriginal immunisation liaison officer Joanne Cheatham, WSLHD Aboriginal Health Service manager Belinda Cashman, Westmead Hospital Aboriginal liaison officer Narelle Holden, Westmead Hospital deputy social work department head Nicole Hraiki and department head Theodora Bikou and Westmead and Auburn hospitals general manager Brett Thompson. “We continue to work closely with local Aboriginal and non-Aboriginal agencies, creating and strengthening partnerships within our service to provide culturally appropriate healthcare,” Belinda said. Aboriginal Elders Wilkinson Zona, Jennifer Ebsworth and WSLHD chief executive Graeme Loy, Elaine Gordon, Lenore Smith and Harold Hunt cut the cake as part of the Close The Gap celebrations at WSLHD Aboriginal Health Service at Mount Druitt Hospital.